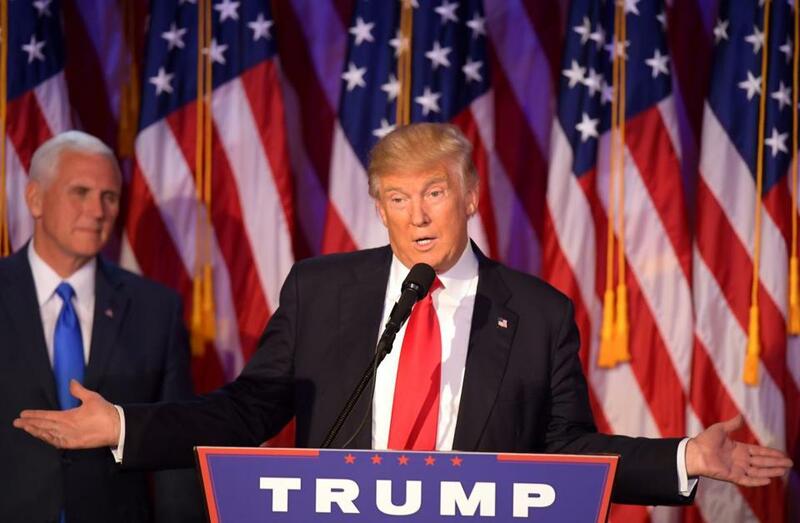 Republican president-elect Donald Trump spoke on the morning after Election Day. WASHINGTON — Donald Trump’s presidential transition team has asked the State Department to disclose how much money it provides each year to international environmental groups. It’s the latest example of how the incoming administration is reassessing the US government’s approach to tackling climate change and other environmental priorities. The individuals spoke on the condition of anonymity because transition communications are confidential. It was unclear which specific groups the transition team was referring to in its question; a spokesman for the president-elect did not respond to a request for comment Monday night. The State Department has worked aggressively under President Obama to support international initiatives to cut greenhouse gas emissions linked to climate change, but Trump has vowed to pull back from such efforts. On Nov. 1, Trump said he would ‘‘cancel billions of dollars in global warming payments to the United Nations’’ and instead devote that money to green infrastructure projects and environmental protection. His campaign released a policy statement that day suggesting he would ‘‘cancel all wasteful climate change spending,’’ which would include the elimination of all of the federal government’s international and domestic climate programs as well as a rollback in regulations aimed at cutting carbon emissions. The campaign estimated these moves would save $100 billion over eight years, though it did not release a detailed accounting. As part of the Paris climate agreement reached a year ago, the United States pledged to donate $3 billion over four years to the Green Climate Fund, a multinational fund designed to help poor nations adapt to the most severe climate impacts and develop renewable sources of energy. So far, the administration has provided $500 million to the fund. The State Department does spend money on global efforts to reduce greenhouse gas emissions, though it is unclear how much is budgeted annually. According to a 2013 Congressional Research Service report, federal spending on climate change initiatives between fiscal years 2008 and 2013 totaled roughly $77 billion. Two-thirds went to developing carbon-free technology and deploying those advances, and most of that work was undertaken by the Energy Department, not State. The State Department has not responded to the Trump transition team’s question about its support for international environmental organizations, a person familiar with the request said. PALM BEACH, Fla. — President-elect Donald Trump on Tuesday met with candidates for his unfilled Cabinet positions, including prospective hires to run the Department of Veterans Affairs, a beleaguered agency that the Republican businessman has vowed to overhaul. At Mar-a-Lago, Trump’s palatial Florida estate, Trump was slated to meet with Luis Quinonez, who runs a company with military and health care ties and is said to be under consideration for VA secretary. He also was set to meet with Toby Cosgrove, CEO of the Cleveland Clinic, who was a top contender to replace Eric Shinseki when he resigned from the VA in 2014. Cosgrove later withdrew from consideration. Trump repeatedly pledged during the campaign to fix the department and said he would ‘‘take care of great veterans.’’ But he also came under scrutiny for being slow in paying out money raised for veterans groups and for suggesting that ‘‘strong’’ veterans don’t need treatment for mental health problems. Others said to be considered for the post include former Massachusetts senator Scott Brown, Florida Representative Jeff Miller, and Pete Hegseth, an Army veteran and former CEO of Concerned Veterans for America. Trump is also considering Jovita Carranza, who worked in President George W. Bush’s administration, for US trade representative. She served as deputy administrator of the Small Business Administration under Bush. With just a handful of Cabinet posts to fill, Trump is facing some criticism for a lack of diversity in his senior team, which currently includes no Hispanics. The National Association of Latino Elected and Appointed Officials said Tuesday that it was ‘‘deeply concerned’’ about the lack of Hispanics considered for top jobs. Carranza was a member of Trump’s Hispanic advisory council during the campaign. Pence, meanwhile, met in Washington with former Texas state official Susan Combs, who served both as agriculture commissioner and comptroller. Trump also needs to fill the Agriculture Cabinet slot. Transition officials did not immediately confirm if Combs is up for that post.